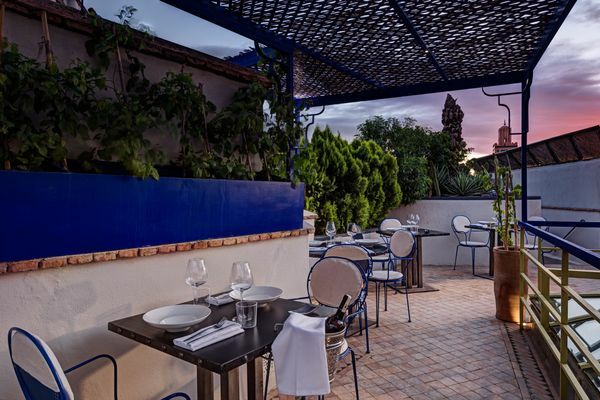 The opening of Le Trou au Mur last month has brought a breath of fresh air to Marrakesh’s restaurant scene. Run by the award winning hoteliers behind Riad Farnatchi, long regarded as one of the most refined addresses in the city, the restaurant located opposite is stylish and sophisticated by design, laid back and intimate, yet above all, totally serious about food. A pioneering endeavour to share some of the most interesting dishes and vibrant rich flavours of Morocco’s vanishing past using traditional recipes passed down through generations as well as a few carefully chosen classic modern British dishes. Le Trou au Mur is proving to be a remarkable culinary treat for ‘those in the know’. Combining a unique blend of traditional Moroccan craftsmanship with contemporary furniture, the décor is refreshingly light and airy. Spanning three levels guests can choose to eat open air on the roof garden or in the elegant main restaurant with its inviting, warming log fire in the cooler months. With an extensive martini menu, Le Trou au Mur is the perfect place for an evening cocktail, a romantic supper or a memorable dinner with friends. An innovative menu inspired by the delicacies of forgotten Morocco provides a welcome, authentic change from the usual parade of tagines and the wine list focuses on Moroccan wine. With its own traditional clay mechoui oven on view, melt-in-the mouth tender mechuoi roasts are a main feature but no less so than a variety of carefully researched old family recipes rarely seen outside private homes. A few classic British favourites on the menu include a delicious Berber shepherd’s pie and donuts where you inject your own filling. Le Trou au Mur aims to combine the very best of Moroccan home cooking with a few of those indulgent comfort dishes one yearns for when away from home. An exciting development from the Riad Farnatchi team, whose characterful, luxurious hideaway opposite boasts a small guest-only restaurant that receives consistently excellent reviews. Le Trou au Mur promises to give guests, visitors to Marrakesh and local residents the opportunity to sample a taste of ‘forgotten morocco’ with a sprinkling of Farnatchi magic. Previous articleAre You Prepared For Your Next Fishing Trip?